What is it exactly they need the funding for? €90,000 a year is a lot of money. Hi Termagant! The 90k figure would allow the centre to employ a Resource Centre Manager and an Outreach and Education worker to sustain and expand the work they do. The bare minimum in sustainable funding being sought ‘to keep the lights on’ is in the region of 27k. Thanks. Wow, so, if the HSE followed the lead of Britain’s National Institute for Clinical Excellence (NICE, which assesses cost/benefit of drugs for the NHS) and withdrew funding for Orkambi, then the HSE would be able to fund 100s of such outreach centres. But, instead, you know, political pressure. Iv’e worked on a project similar in the past and they really would put years on you. On one side you are permanently begging but on the other, you can see how precious these services are to those who use them. We have Dublin Pride coming up, with Leo and Simon having a nice parade photo shoot no doubt, but places like Amach! are the real deal, where a soon to be member of the community can find their feet and figure out who and what they are. 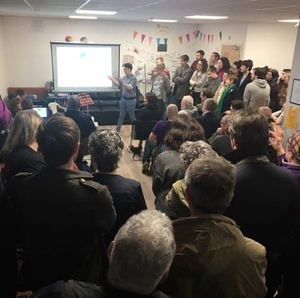 I’d trade all Prides in Ireland for one of these centres in every town and city across the island- they really are that important. When you see the difference they can make, the amount they are asking for is buttons in the grand scheme of things. Best wishes to everyone in Amach! and thank you John for your contribution on Broadsheet. Time for the LGTB community to put it”s hand into it”s own pocket, for a change. I suspect that even if they could, you’d have them closed down anyways. Well, he has a point. The adult LGBT community tend to be more prosperous than the population as a whole. For €90,000 a year all you’d need is 500 committed members of the LGBT community giving €15 a month by direct debit. Also, I note the Department of Social Protection is subisidising the service with free labour through the Community Employment scheme. How much is that saving them? I’ll see your rhetorical comment and raise you any number of other services part or fully funded by the taxpayer and we can decide which may or may not ‘deserve’ this funding. For my opening hand, I’m going to go with tennis courts in South Country Dublin that happen to be in a certain ministers constituency or perhaps some golf course that charge nearly 5 figures sum memberships getting lots of lovely moolah from same ministers department? Should I go on? LGBT people are still more likely to experience social exclusion and mental health issues but hey, those voters need to golf and those private schools need more tax payer funding eh and that minister needs votes? Or we could skip the whole thing because I have a feeling this is more to do with who is getting the money. Always someone looking for a handy auld number, courtesy of the taxpayer. What is your opinion on the estimate that 90% of all trolls on the internet are paid? Not everyone you disagree with is a troll. Anyway, stop digressing, you big silly. 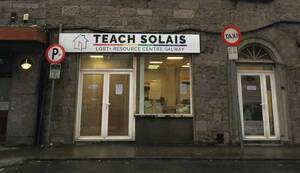 Was there not issues around this organisation running Galway Pride in the past? Or is that a different Amach group?